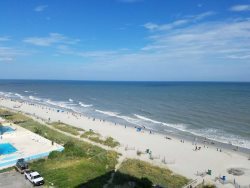 Endless amenities in the heart of Myrtle Beach! This is a 10th floor pool and ocean view unit at the Landmark Resort! The studio is furnished with two full sized beds, full bath, a wet bar and a private balcony with ocean view. The wet bar area includes a sink, cabinet space, a microwave and a mini fridge! Room was just as advertised. Room was clean and beds were comfortable. I'd stay again.